People like to shop around for the best price quotes these days. Everyone wants to make sure they are getting the best deal possible. Businesses should be prepared for the customer calls with this Price Quote Template. No matter what business your in, medical or the body shop industry, being prepared is important in growing your business. Using this Price Quote Template is easy. It’s downloadable free from this site. The template is also customizable to grow and change with your business requirements. Just download the template, customize it or not; you’ll be on your way to full filling your customers’ needs quickly. It’s completely free on this page and available to you. 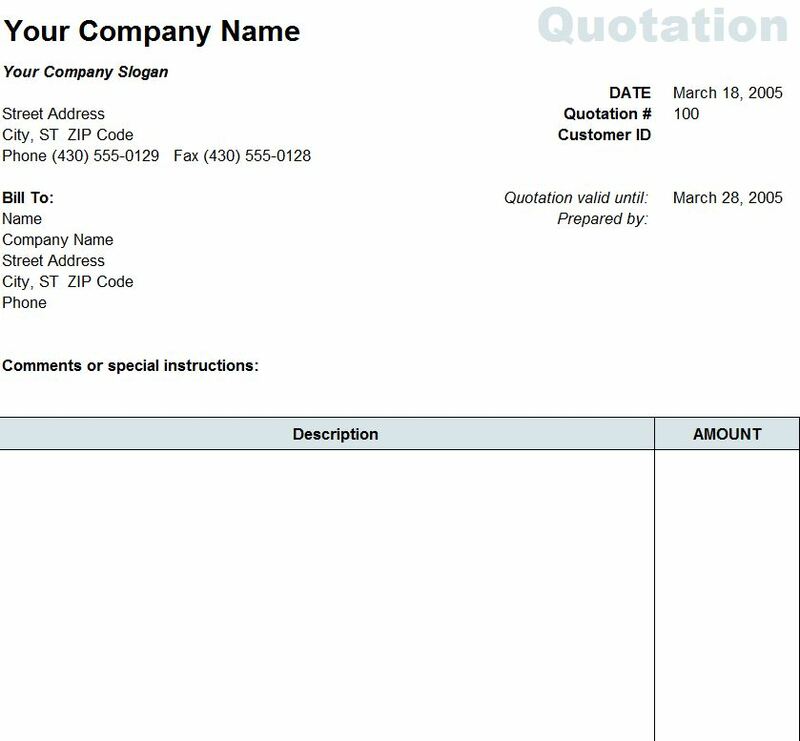 Download the Price Quote Template and save it in a known location. Customize it by clicking on any of the fields you wish to re-size or move around. To move fields just set your pointer to the corner of the box and drag & drop it into place. To re-size or add color just click the field you want and adjust the desired format from the ribbon options under Home tab – Fonts. Enter the company information and logo. There is a description area to specify what the quote is for. Example: “Lumbar adjustment, heat & cold packs, muscle cream”. Then enter the dollar amounts needed under the Amount field. This will automatically calculate all of the entered amounts for you before tax. The calculations field allows you to easily give out quotes for your returning customers and prospective customers as well. Using this template can help you grow your business because easy to get quotes from businesses is attractive to customers. Everyone wants to be sure they are getting the best possible deal. It also helps your customers’ budget out their expenses. On the business side of things, you can reach a wider array of clients through e-mail or website expansion. Statistics can also be drawn from tracking how many of your customers come to your business versus the quotes you sent out. You can see where, if any, improvement is needed in your business model.